Hanging a quilt can be quite a big event – Finally after all your hard work you have finished your masterpiece and the next big question is how you are going to display it! Hanging a quilt means you need to have a space on a wall that is larger that the actual size of the quilt and preferably where it will be noticed by your family and friends. There are a number of different types of quilt hangers depending on what you are looking for. However, they all generally rely on the same concept, which is to squeeze the fabric in between bits of wood and then tightening the screws to make sure the quilt does not slip. You can have small clasps that are evenly spaced across the top of the quilt or one large beam that will almost cover the entire topside of the quilt. Having one long beam of wood is great if you are not fussed about the hanger detracting from your boarder. 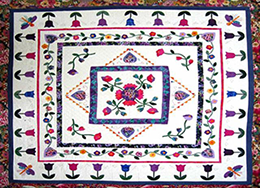 Many quilts have the focus on the centre and the boarder is less of a concern to their creators. However if you are trying to make the quilt hanger a little more inconspicuous then you might be better off with little clasps rather than one large one. As with quilt racks, quilt hangers come in a variety of different woods, with the most popular types being oak, pine and cherry. If you are after a specific kind of wood you can ask you local furniture maker to create one out of that particular type or you can stain your existing wood. Wood stains come in all different colors and wood grains, using a stain on a normal piece of pine or oak you will be able to create whatever finish you wish to suite the rest of your house décor. There are many places where you can get hangers for your quilts. As they are usually quite easy to put together, one of the more popular things to do is to assemble your own quilt hangers. The advantage of this is you get to color the wood so it perfectly matches the room where the hanger will be placed and also complements the fabric of the quit. Showcasing your quilt is fast and easy with these quilt hangers. Just measure and secure quilt hangars to wall insert quilt in slot and hang! The hangers can be painted or stained to match your room décor.